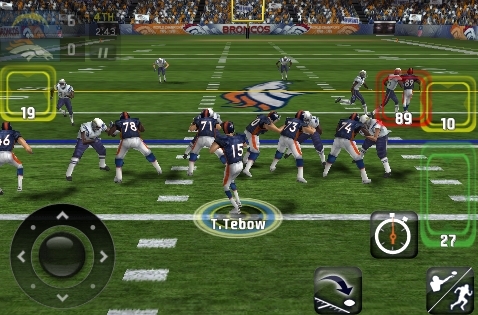 Many of us have played the Madden series in one form or another. 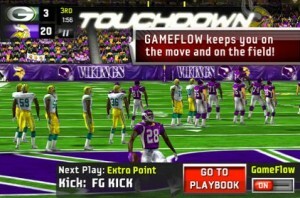 Now it’s comes to the iphone in it’s current 2011 season. Overall it’s a very polished game and it does justice compared to it’s super powered brothers on the consoles and PC. The graphics and animations are great and well done. The Controls are good for a touch based system although it’s hard being precise in running with the virtual stick. The actions buttons on the side are also a little hard to use because you cover most of them up with your thumb. Non the less it’s a very enjoyable game with several modes of play like, exhibition, playoffs, and season which should be enough for someone on a phone! It also employs the gameflow option with is great to progress the game along and not worrying about picking the right play. All in all it’s a great edition to your iphone lineup of games and as of the time of this posting it is on sale for only .99 which is a great buy. 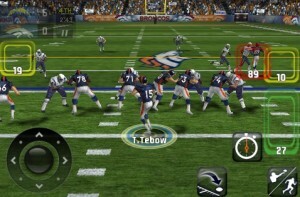 Madden 11 for iPhone is this weeks Game of the Week.